Great news, technophobes: Machines are now learning how to scare us. With the help of deep learning algorithms, an artificial intelligence project dubbed the Nightmare Machine is figuring out how to create the most horrifying human faces possible, and the results are just as disturbing as you might have hoped or feared. “Warning: Images on this website are generated by deep learning algorithms and may not be suitable for all users,” reads a message on the Nightmare Machine webpage. And it isn’t wrong. 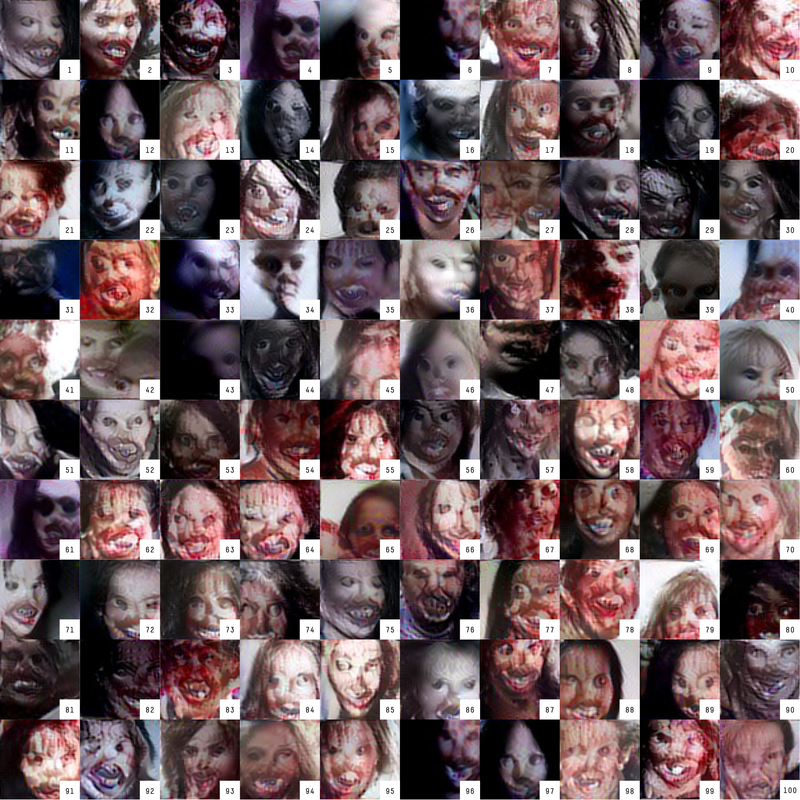 The scariest faces produced by the Nightmare Machine so far look like an Instagram account from hell: eyes replaced with blackened sockets, skin seemingly flayed from bloodied faces, lips pulled ghoulishly back from the teeth of rotting corpses. But if we find the facial phantasmagoria dismaying, we have only ourselves to blame. After all, it learned everything it knows about horror by watching us. As Halloween approached, their thoughts turned to a more ominous question: Instead of learning how to build trust with humans, could the artificial intelligence learn how to inspire fear? Although there’s something particularly alarming about asking artificial intelligence to perfect the creation of a nightmare in human form, this isn’t the first time AI has been used to generate horror. Recently, “Impossible Things,” a horror film whose primary narrative elements were “co-written” with an AI that had been trained on the plots of thousands of other movies, was successfully crowdfunded on Kickstarter. Although Yanardag noted that the faces generated by the Nightmare Machine are remarkably creepy, she said there’s still a lot of room for improvement. “There is extra information in how humans perceive horror that can be exploited to make even scarier faces or even personalized horror images where we tailor the generation process to the individual data,” she said. That’s right — not only can machines home in on what people in general find the most frightening, but with a bit more data, they can also become experts in scaring you specifically. It’s a concept eerily reminiscent of a recent episode of the sci-fi series “Black Mirror,” in which a young man playtests a virtual reality horror game only to realize that it’s combing through his memories to create personalized moments of terror. This was an edition of If Then Next, a column that explores how algorithms intersect with culture and our everyday lives. Got feedback, suggestions or a news tip? Leave suggestions in the comments section or tweet to me @laura_hudson.